Our first seminar has come to an end and it is hard to believe we have only been here for two weeks. Days have been packed with lecture in the mornings and meetings with political leaders, civil society groups, and even local media in the afternoons. The Malaysian hospitality has been great – we are so warmly greeted at every meeting we attend and always served tea and refreshments. Food is an integral part of their culture and it can always be found no matter what time of day. 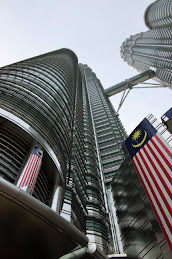 Malaysia’s multi-plural society divided between the Malays, Chinese, and Indian populations creates a very dynamic culture. It is easy to identify people based on their ethnicity because the different groups are segregated and have retained their unique cultures. For the most part, the various ethnic groups have been able to co-exist peacefully respecting each others customs and cultures. Next week we will be traveling to Eastern Malaysia which as one of our guest speakers has said “is like a completely different country”. I’m excited to see the cultural differences that we will find there!